Sometimes I wonder how the sheer volume of stuff that happens to me can happen to me. Life is so fast-paced and filled to the brim with all manner of wonderful, heartbreaking and amazing things. It is almost all I can do to live through them all and have some way to move on, to make sense of it all (if I can) and still manage to breathe in and out. It isn't that I'm just busy, with the stress of the holiday season and the daily grind of work and play that fills my schedule, though I could blame that. It's the fact that life is constantly surprising me with how strange, complex and deep it is. It would be easy to live without noticing all the little ironies of daily life, how the people I graduated from college with are (not) using their degrees, how the sun shines on the righteous and the wicked both, how people that I've dismissed before suddenly take on new shades of meaning (wit, depth, interest, sorrow). There is something deeply personal about living that I simply can't ignore, though sometimes I would like to. It would be easier to put this squirming, slimy ball of energy into a sterile box and treat it with gloves, hands off. Life has a way of getting out of those boxes and making everything messy, whether I like it or not. One of the things God has been teaching me since graduation has been the importance of focusing on the present. Not the tempting nostalgia of the past with all of its sunny views of things that were really much harder than I remember, not even the exciting possibilities of the future in all the glory it can muster. Right now is all I've got. I was doing some window shopping with my brother this past week downtown and was struck by the Banana Republic windows. 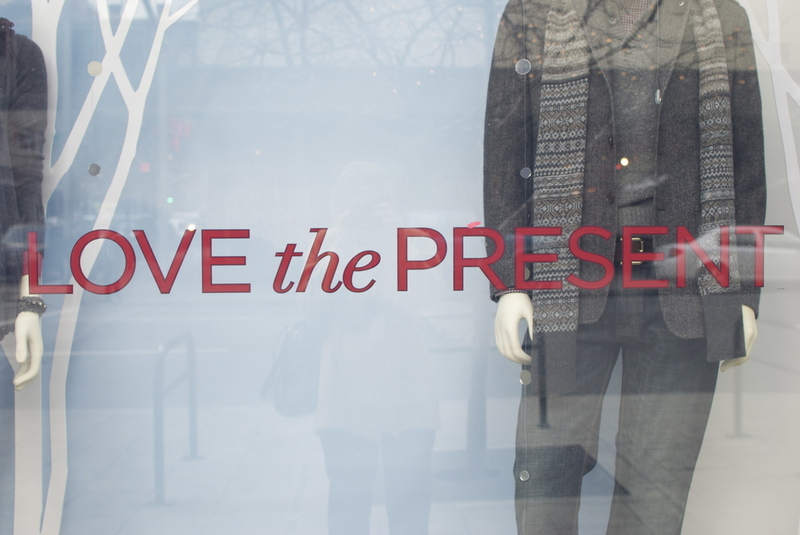 They all say: Love the Present. I have a feeling that they have a different present in mind, but as you will know if you've read my post on Avatar, I rarely worry about what people mean by things when I find truth in them, raw and unrefined. These words jumped off the glass. So, in the midst of this Advent season, we wait: for Christmas, for all to be made right in the world, for Jesus to come back, I invite you to love the present, all the squirming, gross mess that it is.